This 70-worder is filled with fresh entries. “DO YOU HEAR ME?” is maybe a little iffy (and is EBOLA SCARE really a thing? ), but I really like SHEEPLE, PATRON SAINT, AIR KISS, RACE BIBS (these are the Tyvek sheets with a competitor’s number on them—my husband has a zillion from his past races and no, I don’t know why they call them “bibs” when they’re safety-pinned to a shirt), UCONN, IKEA CATALOG, “NOT A CHANCE,” UZO ADUBA, the MUNCHIES, GYM DAY, DECEPTICON, and SKI LESSONS (cute clue, [Higher education?]). Are WIIMOTES getting much use these days? Not sure if the Wii successors use the same controllers. More importantly: If you have a Nintendo Switch, are you loving it? Least favorite fill: IDYL, Portuguese ELAS, ASHCAKE, REOS. 17a. [Joseph, to the Catholic Church], PATRON SAINT. I did not know that. This might be trivia I get quizzed on at some point. 58a. With 54-Down, river of the Carolinas], PEE / DEE. Hey, P.D., your river is in the puzzle again! 5d. [Emmy-winning “Orange Is the New Black” actress], UZO ADUBA. She plays Suzanne. Raise your hand if you filled in UZOADUB- and then hit the skids, forgetting if it’s ADUBO or ADUBA. Lots of cute clues here, along with the mostly zippy and/or solid fill. 4.25 stars from me. [18a: Gives in]: CRIES UNCLE. The Sun, our star. [28a: Self-proclaimed psychic known for TV spoon-bending]: URI GELLER. Rigel is the brightest star in Orion, and is either his left or right foot, depending on your perspective. [41a: Moneymaking enterprise with holes in it? 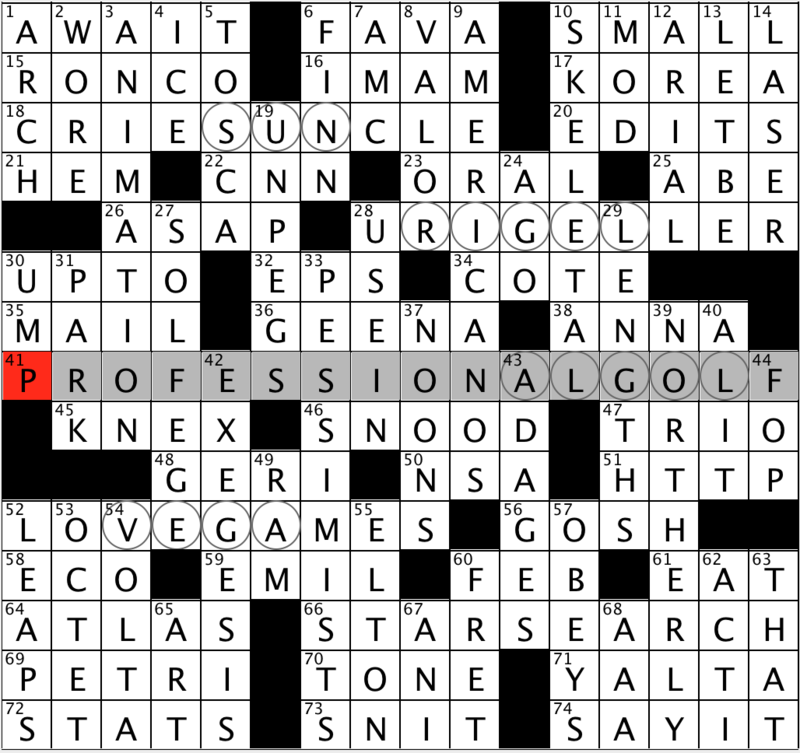 ]: PROFESSIONAL GOLF. Algol, in Perseus, is a multiple star. [52a: Certain tennis shutouts]: LOVE GAMES. Vega is the brightest star in Lyra, and is relatively close to us at a mere 25 light years away. 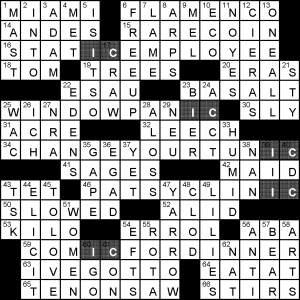 [66a: 1980s-’90s TV show hosted by Ed McMahon, or a hint to this puzzle’s theme]: STAR SEARCH. Looks like we found them all! Not quite a letter addition Friday today, but in that vain. Words with trailing E’s have those changed to IC. No revealer, just a selection of entries, PATSYCLINIC being the best of the bunch. The rest, at least, are not overly strained. Okay, looking again, WINDOWPANIC is a bit, actually. The partials, particularly six-letter TOLOVE, and parallel German are among the most egregious examples of short fill that was generally stodgy, a symptom of the crowded grid. This entry was posted in Daily Puzzles and tagged Alex Eaton-Salners, Jeffrey Wechsler, Sam Trabucco. Bookmark the permalink. NY Times: Is “camera shop” a thing? I guess it was a thing once, though not sure it was actually called a “camera shop”. Not really happy with ski lessons clue, ebola scare (was this a phrase?). I feel like I know a gazillion words for cornbread, but ashcake is not one of them. Grr! I know I’m going to feel stupid once I hear the answer, but it’s driving me nuts…why is “You might make one in your lap” an OVAL?? Lap as run on a racing oval, I think. I didn’t care for this so much. SCATHE and BATE and REGALEMENT are never-used-in-real-life words, GYMDAY doesn’t sound like a phrase anyone actually says, then there’s DECEPTICON and UZOADUBA, the latter being just a string of letters to me. There’s some nice stuff here but I thought it was offset by a lot of things that seemed deliberately obscure. I won’t countenance “just a string of letters to me” as a dismissal of an artist you don’t know, particularly when the artist is a person of color. Would it not be better to say “I didn’t know the name, but I want to learn who she is”? “just a string of letters” is exactly how her name comes across to me. 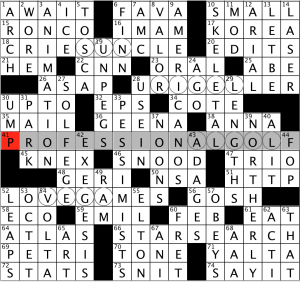 I have the same problem with trendy white hipster bands in BEQ’s puzzles. I really don’t see what her color has to with it. Dismissal of the names of people of color is common in mainstream culture, and it’s a piece of systemic racism. All of our names are “just strings of letters.” This particular string of letters is unfamiliar to you because it’s of African origin. That’s your problem, not the puzzle’s. I had trouble with two vowels in her name because I don’t watch the show. Next time we meet in the puzzle, it will be different though ;). Gym Day strikes me as something a busy person might say, but frankly, it would reveal how little the person is involved in going to the gym. Gym memberships are almost always monthly, so going infrequently on some particular schedule is not accessing the gym or utilizing the membership very well. It would not be a gym day, but I can think of situations where someone could only access the arena on a specific time and day of the week. I used to be in a lawyer’s hockey group that had ice time from 5-7 Sunday mornings. I don’t know of any gym counterparts. I’m going to set a GYM DAY for my New Year’s resolution! 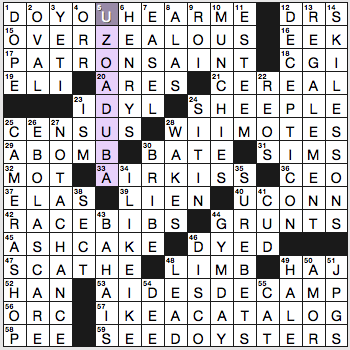 But darn that brilliant actress UZO ADUBA for not changing her name to something regular folks can easily spell. … though I assume regular folks in Nigeria have absolutely no problem with the spelling. Yep! I think she’s great, and I was glad to see her in the puzzle. Her name is spelled exactly as it sounds. REGALEMENT? No comment on that super-stretch of a word? Otherwise loved this Friday puzzle. Yeah, I wasn’t keen on it, but I wasn’t worked up enough to mention it. Yeah, I was Naticked in that area, couldn’t suss out “Power suit” for CEO, somehow stuck on GRUNGE for the “Lowly workers” (thinking the answer for “Wining and dining” would also be a gerund) and not familiar (at all) with Transformer characters. The patron saint of the Catholic Church is the Virgin Mary, Mother of Christ. In 1870, the pope declared Joseph for an obscure reason. I was brought up a strict Catholic. I saw this clue & the Joseph answer many years ago & asked my parish priest. He assured me it is Mary. Don’t horses wear race bibs? That’s the image that came to mind when I filled it in.